Are you dissatisfied with Microsoft Office 2010, Microsoft Office 2007 or Microsoft Office 2003, for the ridiculous price, for slowness to load, and whatever reason? Especially after you upgrade your system to Windows 10 or Windows 8, the idea for searching for a Microsoft Office Replacement become more and more stronger in your mind. WPS Office will be the right choice for your to replace MS Office Suite for taking over Word, Excel, and PowerPoint. It’s compact, fast, attractive, and totally file-compatible that really worth giving it a try. WPS Office for Windows 10 and Windows 8 is equipped with three state-of-the-art office programs: Writer, Presentation and Spreadsheets. The Windows 10 and Windows 8 Microsoft Office replacement features as powerful as Micrsoft Office, fully compatible with Microsoft Office, as well as with unique highlights such as much smaller file size (only 55.15 MB), convert office documents into PDF formats, convert PowerPoint to Word document and much more. The word processor that can totally replace Microsoft Word. Writer’s compatible formats to Micrsoft Office and ability to export PDFs make it stand out from other word processors. You can open, edit and export Microsoft Word files in Writer like using Miscrosoft on Windows 10 and Windows 8! An alternative and replacement for Microsoft Excel, Kingsoft Spreadsheets Professional 2012 includes a calculator, graphing tools, and multiple other tools for complex data analysis. Besides that, it also supports more than 100 commonly used formulas, and a plethora of functions to aid in data analysis. It can not only import and export .xls or .xlsx files, but also produce other file formats such as .et, .txt, .csv, .pdf, and .dbf. As the best Micrsoft PowerPoint Replacement on Windows 10 and Windows 8, Presentation Professional creates top-notch presentations that equal Microsoft Power Point presentations. Impress can create PDF files and Flash files, and create, save or download presentation templates. It can not only import and export PowerPoint files,but also produce .dps and .pdf files. The Microsoft Office Replacement can open, view and edit Word/Excel/Powerpoint (97/2000/2003/2007/2010) as well as export to Word/Excel/Powerpoint format. Convert office documents, including Word, Excel and PowerPoint files into a PDF format using our built-in PDF converter. Kingsoft Office Suite Professional multiple tabs function enables users to quickly find the correct file by allowing more than one document to be opened within a single interface. Hello Donal, Kingsoft office suite professional has 30-days free trial period with full features and functions. When the trial period expires, you will need to pay $69.95 for lifetime usage for the current version. if you buy from TechiSky, you will enjoy 30% off authorized discount code by Kingsoft, that is $48.95. You can enjoy free upgrade to most latest version for at least 3 years. After that, you can enjoy free update and may pay around $10 for big upgrade. Kingsoft office for Android, Kingsoft office for iOS and Kingsoft office for Linux is totally free. You needn’t pay separately. Sorry, there are no online brochure right now, but the support team will give you quick reply about your question. I am totally fed up with Microsoft. Wanting to change. Can I import my present Word documents into your software, or even open them as they are, without a lot of hassel? 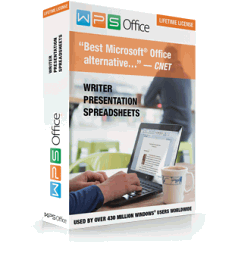 WPS office is the best office software compatible with MS office. You can open them as they are, without any hassle.